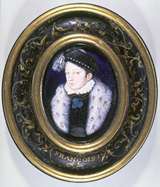 This portrait on enamel shows Francis II of France, the first husband of Mary, Queen of Scots. It belongs to the Scottish National Portrait Gallery, and although its early provenance is unknown, it is unlikely to have been in the Hamilton Collection. The artist is also unknown but was possibly Leonard Limousin I. In an oval, Francis is seen at about the age of 14, wearing a court bonnet with a jewelled hat band and a fashionable coat trimmed with a fur collar. According to tradition, it was Francis who gave Mary the famous Lennoxlove casket. The casket is certainly of the quality to have been owned by the French royal family, and Mary is known to have received many gifts of jewellery and other precious items from Francis, his father Henry II of France and their relatives.